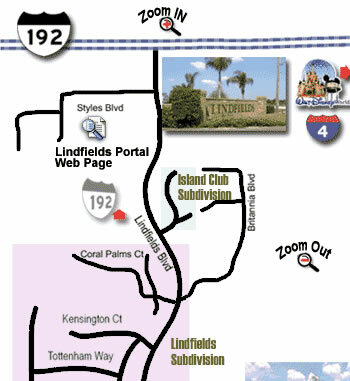 Located just 4.5 miles west of Walt Disney World® off of Highway 192, Lindfields remains one of the most popular and sought after subdivisions / estates for holiday makers to central Florida. Lindfields has a calm maturity that has endeared it to thousands of tourists. Added to which, it is extremely well lit at night, and is regarded as a particularly safe area in which to stay. Being just 10 minutes drive from the main entrance to Walt Disney World®, yet with the advantage of a secret shortcut to avoid the traffic at busy times of the day, Lindfields is a welcome and peaceful retreat from all the hustle and bustle just a few miles down the road. Another bonus for holiday makers staying in Lindfields villas is that the pool and sun deck sizes tend to be a lot larger than some of the newer properties on other estates. And with a huge selection of smaller attractions, shops, diners and restaurants approximately a mile away, you will easily find something to suit all tastes and pockets, when it comes to eating out or bending the plastic on a shopping spree. For the more sporty, the Orange Lake Country Club, which is a mere ½ mile away from the entrance to Lindfields, provides a challenging and immaculately maintained golf course, and is just one of over a dozen championship courses available to you within a 30 minute radius of the estate. Continuing to mature, and constantly building on it’s already incredibly popular reputation, Lindfields is an ideal and tranquil setting for your Florida vacation.